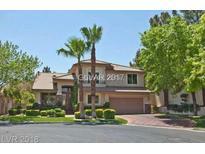 Below you can view all the homes for sale in the Country Rose Estates subdivision located in Las Vegas Nevada. Listings in Country Rose Estates are updated daily from data we receive from the Las Vegas multiple listing service. To learn more about any of these homes or to receive custom notifications when a new property is listed for sale in Country Rose Estates, give us a call at 702-930-8014. Oversized master with his and hers closet. MLS#2066009. LVRE.com. Marble flooring, plantation shutters, stainless steel appliances, granite counters, dual convection ovens, desk, walk in pantry, large breakfast nook, island, 3 fireplaces, media room,family room with wet bar, master bedroom has siting area with fireplace adjacent to balcony, cabana BIBBQ MLS#2035982. Easy Street Realty Las Vegas. Premier Home located at desirable Country Rose Estates in Summerlin!-Features include: Outstanding Open Area Gourmet Kitchen with adjacent Spacious Downstairs Family Room with Soaring Vaulted Ceilings, Large Master Bedroom with Spacious Bath-Separate Downstairs Den or Professional office- Downstairs Laundry Room with included Sink-Property is professionally landscaped front and back in a lovely Summerlin Guard Gated Community! MLS#2004297. Realty ONE Group, Inc.